Search of devine with in our soul is the ultimate goal of our life.” Building the same is Seth Ratanchand Ji Surana was indulged in social and religious works throughout his life. Late Smt. Shakkar Bai Ji Surana also paved footsteps of her husband his family too is secular, personate about pain of others and also believes in company of saints and follow spiritual preaching of them and are ready for it even today. After hearing the proposal Smt. Shakkar bai ji Surana immediately declare donation of Rs. 50,000/- with the request of establishing the college on name of Seth Ratanchand ji Surana and a family member should be a nominated as donating member of the college committee. 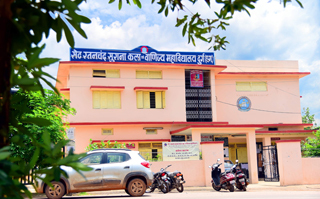 Seth Ratanchand Surana arts and commerce college was established in 1964 because of commendable donation of this family and now this college conducts various courses of Arts, Commerce, Physical Education, Computer Education, B.Lib., M.Lib. etc. which benefiting students of this area. Shri Inderchand Surana son of Late Shri Suganchand Surana is donating member of committee of the college. He too is a pass out of 1966 batch of B.Sc., B.E. (Mech. Engg.). He is simple hearted and full of humanitarian values along with his brother Shri Satishchand Surana they have set a great example of benevolenceby building emergency unit on his mother Smt. Mula devi Suganchand Surana in government hospital, Durg and upgrade Seth Ratanchand Surana eye hospital In 2011 C.G. Govt. has awarded Danveer Bhamasha award to them. They are associated with many social organization like central India of Medical Science Nagpur, Chhattisgarh State Council for Child Care, Udyachal Rajnandgaon, Devanand Jain School Rajnandgaon, Jeevandeep Samiti Distt. Hospital, Deaf mute school Padmanabhpur, Durg. His younger brother Shri Satishchand Surana is appreciated for his uncommon contribution towards NSS unit of the college.